Whilst most acknowledge that Renault has done more than any other manufacturer to popularise the mini-MPV sector that hasn't stopped several other car makers wading in with their own wares. 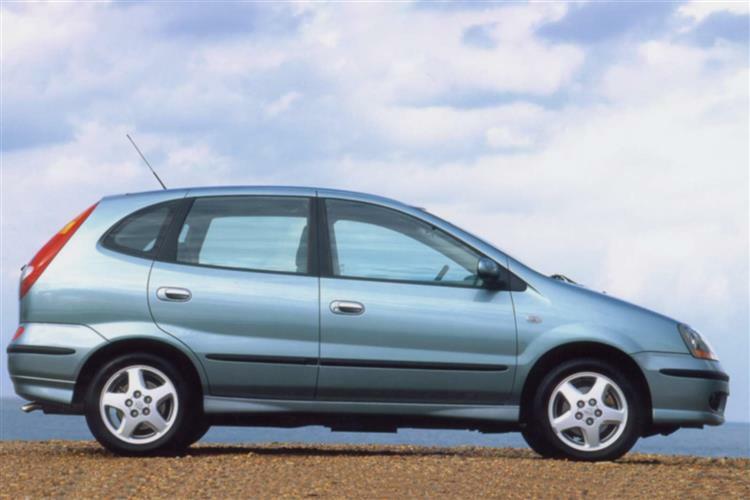 The Citroen Xsara Picasso and Vauxhall Zafira have both done well, but the Nissan Almera Tino has always been something of a dark horse. Better to drive until most of its rivals, the Tino never struck a significant chord with British buyers, making used examples something of a bargain. With a range of decent engines and the obligatory clever packaging solutions, the Almera Tino makes very smart business second time around. The Almera Tino was introduced in July 2000, and utilised a marketing trick that Renault pioneered, namely using an established name and tacking the mini-MPV designation on at the end. This worked for Renault with the Megane Scenic, enabling customers to understand quite what the new car represented and has worked for countless others (think Xsara Picasso and Toyota Yaris Verso) when selling mini-MPVs that look nothing like their more prosaic progenitors. Do we still need to do this? The Vauxhall Zafira has sold perfectly well without being dubbed an 'Astra Zafira' so it's possibly superfluous. Nevertheless, we'll drop the Almera moniker for now. Available with a range of three engines the Tino's lines were slightly sleeker than the Scenic's, but not as lithe as the subsequent generation of mini-MPVs characterised by the Honda Stream. A 114bhp 1.8-litre petrol engine attracted most buyers, probably due to the fact that the handily punchier 136bhp 2.0-litre powerplant retailed at around £2,000 more when new. The 2.2-litre direct injection diesel was in many ways the most impressive engine in the range, also generating 114bhp but accompanied by major torque and a minor thirst. Four trim levels were available, the basic S, the slightly plusher SE and then the upscale SE2 and SE+ variants. Nissan seemed to take their eye off the ball with the Tino's marketing, the product range spawning confusing Twister and Hurricane editions, but in spring 2003 steps to rectify this were taken. The range was simplified to include just S, SE and SVE trim variations, and the engine range was rationalised. A 115bhp 1.8-litre petrol was offered alongside two Renault-sourced common rail dCi diesel units of either 112 or 136bhp. 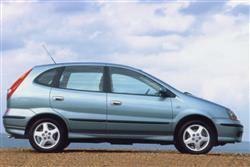 The car was given a facelift, with clear glass headlamps and an interior which featured the N-FORM dashboard architecture as seen in the Primera and Almera hatch models. As soon as the Note arrived in early 2006, the Almera Tino's day's were numbered. As with any other mini-MPV, versatility is the key - and this Nissan is well to the task in hand. At first glance, you might wonder. After all, there are 'only' five seats in a market where other rivals offer six or even seven. Like Renault, Nissan believe that most buyers don't want or need that many chairs. Instead, they've concentrated on getting better use out of the space available, rather than filling it with pews: it's an approach that actually makes a lot of sense. At first glance inside, the approach seems familiar. As with other rivals, there are three individual rear seats, each with its own triple-point seatbelt (though only the outer two have Isofix child seat mounts). These seats are infinitely flexible, with no fewer than 24 different positioning configurations. They can of course be removed and/or folded forward, which in the case of the middle seat means you instantly create a picnic/activity table, with two cupholders and a ribbed section to hold pencils and crayons. Alternatively, you can slide them backwards and forwards on runners that allow 90mm of travel with the centre seat in place and 200mm without. With kids in the back, you can push them right forwards to create a huge luggage area: with adults however, you might wish to slide them right back for extra legroom and that 'mini-Limo' feel. With only two rear passengers, that feeling could be further enhanced by taking the middle seat out completely and moving the two outer chairs inwards by six inches. Since most customers will be carrying kids in the back, Nissan conducted exhaustive research to make the rear compartment as child-friendly as possible. As a result, the original design was altered to create deep rear side windows and back seats mounted 25mm higher than those in the front. This means your offspring will get an excellent view - as will you of them. Surveys have showed that most parents place their youngest child in the back on the opposite side from the driver in order to see them better. So in the Tino, the front seat backrests have been shaved and the front chairs themselves set far apart to give a big, wide space for a clear view into the rear. As in the Renault Scenic, there are two hidden compartments under the floor in the rear footwells but in the Nissan, they're more useful, with lift-out baskets incorporated into the design. Both front seats have airline-style flip-out trays on the back and there's a map pocket underneath each one. Other nice touches include a powerpoint for rear passengers and secure hidden storage under the rear seats. Luggage space should be sufficient for most families and shopping bags can be either secured or separated by endless permutations of loading nets, based around no fewer than ten hooks, several of which can be used to make a kind of hammock that will keep dirty shoes off the carpet. Though the concertinaed rear parcel shelf can't be raised or lowered to different levels a la Scenic, it can be folded from either the front or the back, so that rear passengers can reach behind them to get things from the boot. Finally, for valuables, there's a covered compartment under the boot floor big enough for a handbag. Is there room for improvement? Of course there is. The front seats don't fold for example, nor are they removable (which is irritating when you've something long to carry like a ladder or a surfboard). Those seats that are removable at the rear are so heavy that only fitness fanatics will want to take them out regularly. And if you do remove everything, you'll find that intrusion from the wheelarches and suspension turrets limits the width of what you can carry. Inevitably however, there are areas of compromise with any car of this kind - and the Almera Tino has fewer than most. The two-tone dashboard looks unusual and equipment levels include power windows, twin airbags and ABS even on the entry-level S variant. Plusher SE, SE2 and SE+ models added side airbags, active anti-whiplash head restraints and air conditioning. The later facelifted cars featured side airbags across the range, the SE version adding a rear parking camera and the upscale SVE adding DVD satellite navigation. The N-FORM dashboard looked a lot classier than the instrument panels many rivals sported. Not much goes wrong - it's more a case of looking out for worn trim or those cars that have obviously been subjected to more 'challenging' children. All Tinos enjoy a three-year/60,000-mile warranty (check for a full service history to keep it valid) and the best outlet for decent cars is probably through an authorised Nissan dealer, so you might pay a bit more for peace of mind. The franchise's excellent used car programme (not all dealers participate) should be worth the extra cost, though. That said, the Tino is such a reliable proposition that no matter where you shop it would require some persistence to pick a duff one. (approx. for a 1.8-litre '00 hatchback) A timing chain retails at around £70, an air filter around £10, an oil filter is £7 and spark plugs are around £2.50 each. Those parts that are interchangeable with mainstream Almera models tend to be slightly cheaper than Tino-specific parts, some of which may only be available by special order. You probably wouldn't expect the Tino to be much cop to drive, but you'd be wrong. All models have the capacity to entertain, even the lusty diesel. A low centre of gravity and multi-link suspension give good road feel, and a recent Autocar roadholding test pitching the Almera Tino against its hatchback and saloon brethren found the Tino's limits to be the highest of all! So much for boring MPVs. All models sprint to sixty in around 12.5 seconds, although the 1.8-litre models run out of puff at 107mph as opposed to the others 112mph. The 2.0-litre has more torque to play with and the 2.2-litre diesel yet more again with 44mpg capability tucked up its sleeve. One word of warning regards the optional CVT gearbox - don't. If you value the practicality of a Scenic-style mini-MPV but don't want to follow the herd, the Nissan Almera Tino is worth a look. It won't ever win you any style points but if you're looking for safe, well-equipped and surprisingly good fun family transportation here's one option that won't let you down. Get the best of all worlds? It seems you can in this particular Nissan.